So many of the images I’ve seen about the death of Stephen Hawking are basically about the wheelchair, and how now his body is free. I think it’s a bit of low hanging fruit really, compassionate, easy to grasp, literal, christian imagery. I think they all miss a deeper point, that his mind has always been free. I was reminded of this image, an older cartoon of mine from 2013. < Trump and Kim Jong to talk. 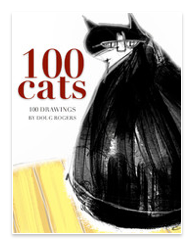 100 CATS is an animal art eBook with over 100 cat drawings for your iPad. 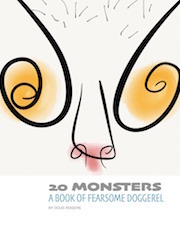 20 Monsters, a free ebook, is a collection of fanciful cartoon monsters and doggerel. A One Day Walking tour through downtown Rome which covers the art history and architecture of two eras. Maps, Photos, Video, a personal guide and thorough knowledge about all the art and architecture you will see. This work, and all images, by doug rogers is licensed under a Creative Commons Attribution-NonCommercial-ShareAlike 3.0 Unported License.